Product #60689 | SKU TT-0511-R-A7 | 0.0 (no ratings yet) Thanks for your rating! This Tilta Right Side Wooden Handle 2.0 with Run/Stop Button & Cable for Sony a7/a9 Series has an ergonomic design to provide maximum comfort while operating the camera in a Tilta camera rig, on the Gravity G2 and G2X Gimbals, or in a shoulder mounted configuration through the attached Arri Standard Rosette. 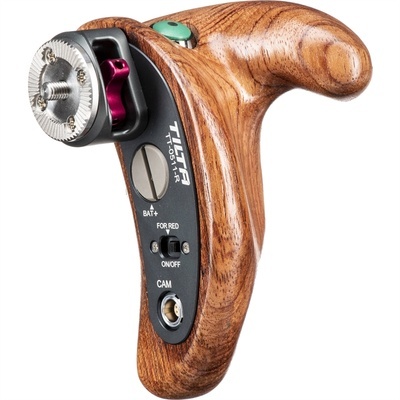 It’s hand-carved from solid black walnut wood and assembled with CNC-milled high grade aluminium-alloy that integrates a Run/Stop button for you to control the camera’s recording features from the palm of your hand via a R/S cable.